Why is your “reluctant reader” reluctant to read? Most parents understandably assume that the reason their son or daughter is reluctant to read is because they just haven’t found a book that they like yet. The child’s response appears to back this opinion up. “I didn’t like that book- it was boring”. 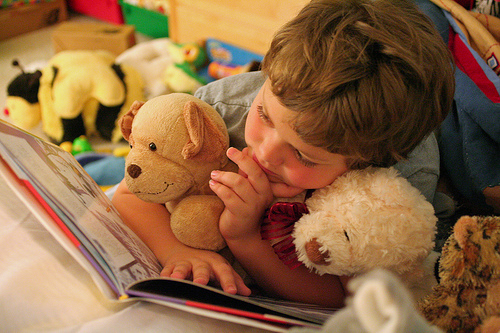 Knowing that reading is a big factor in their child’s progress at school parents often try to tempt their reluctant son or daughter with no end of different books, most of which remain unopened in the child’s bedroom. They even buy the latest children’s bestsellers and can’t understand why their child finds them boring when other readers are loving them. The conclusion they often reach is that their child will never like reading- they just prefer other things. I would strongly challenge that view. In almost every case, I believe that a child becomes a reluctant reader because they are trying to read texts that are just too difficult for them. A book that a child reads for pleasure needs to be much easier than the book they are capable of reading. If they stumble over only a few words when reading alone they can fail to pick up what is going on in the story and as such will find the book “boring” because they don’t actually know what’s going on. As a teacher, I often read books to whole classes of children (right up to the age of 11). Before I get to work on the reluctant readers (typically between 4 and 10 in any class of 30 children) I read a book to the whole class, one that is suitable for their age group. I very rarely have a child who says they haven’t enjoyed a story I have read- often story time is the most popular time of the day. The difference is that the children are not struggling to read the book, they are free to enjoy the story. If you are the parent or teacher of a reluctant reader, try them with something suited to their age group but that is easy to read. I think you may be surprised at how this will entice them into the world of books. If you want to know which level your child is comfortable reading, try them with the varying difficulties of text on our “Reading Levels” page on our main website, Hummingbird Books. In addition, many of my fellow teachers have the view that a child should be challenged in the books they are reading with ever harder vocabulary. I would suggest that the child will tend to push themselves on as their love of reading grows. A radical view, maybe, but I have tried going back several stages with children so many times now and it seems to work in virtually every case. The only children it hasn’t worked with are those that have become so de-motivated by the process of trying to enjoy books that they just can’t get over the hurdle that makes them think they dislike books – maybe 1 or 2% of children. If you have a child like this, you could always try our reluctant readers’ scheme, a one-to-one telephone advisory service for parents that carries a unique money back guarantee if you are dissatisfied with the results. Why not treat yourself for Christmas and give your child one of the greatest gifts of all- the love of reading? You are currently browsing the archives for the Dyslexic readers category.